Hello! 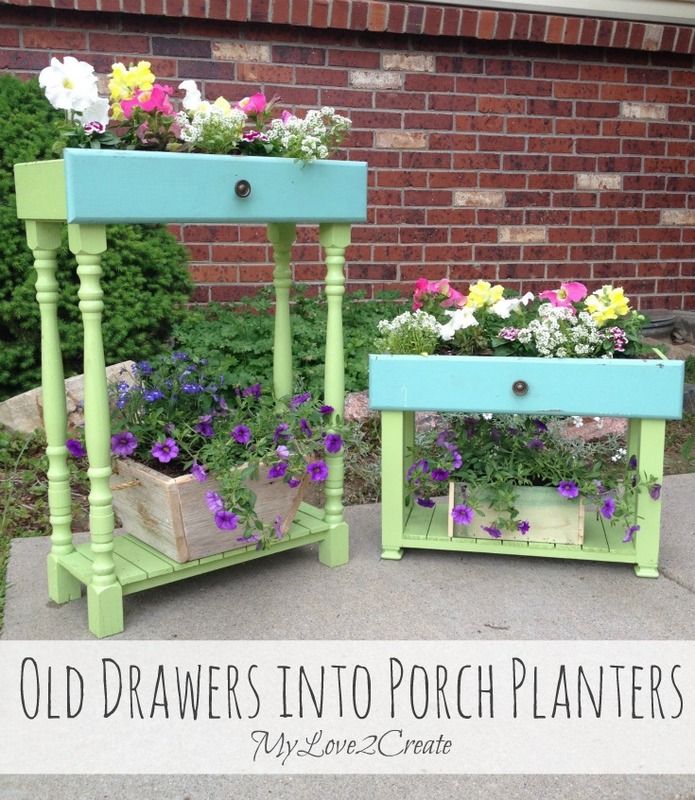 Today I am sharing a repurposed project, old drawers into porch planters. I have seen drawers used for planters several times and loved them....so, here is my version. This project was first seen on My Repurposed Life the end of May, and I have been enjoying them ever since so I am super happy to share finally them on my blog! I have loved having these planters on my porch everyday, they seriously make me happy! 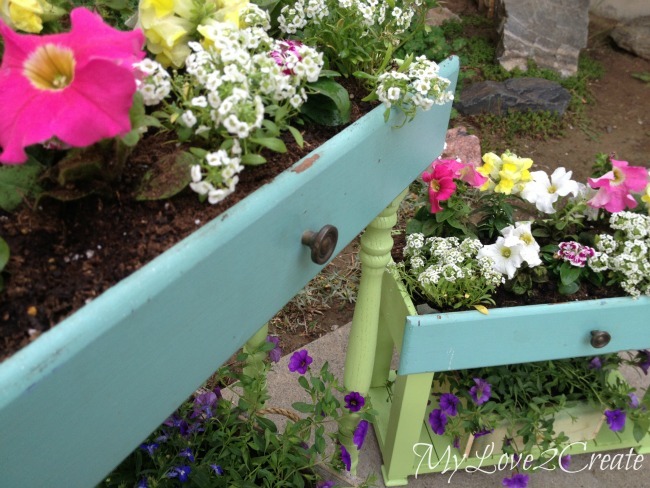 I am excited to show you how you can turn your own repurposed drawers into planters. I picked up these cute drawers on our city's spring clean up day for free. I had been wanting to do some type of planter for my front porch and since these already had a cute color on the front they were the perfect candidates! 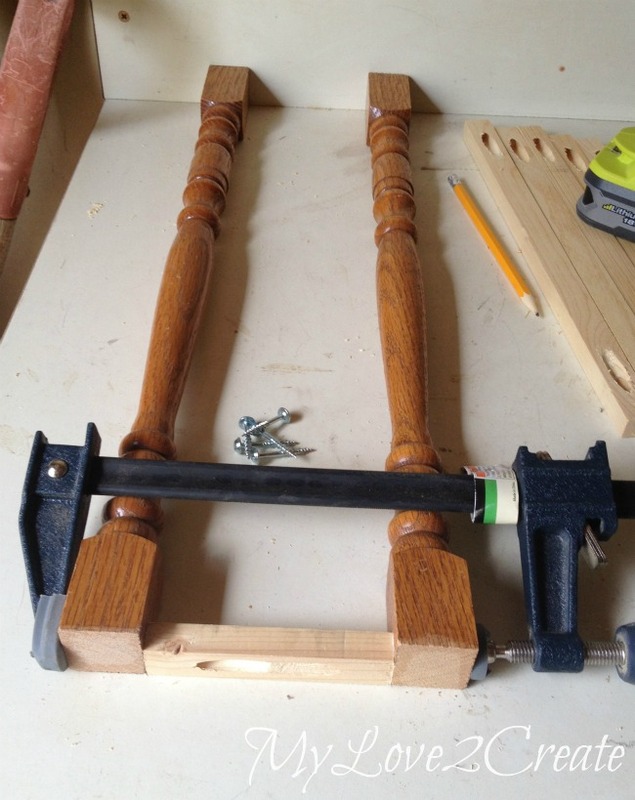 The spindles were $1 at the Restore, I have had them for quite a while. 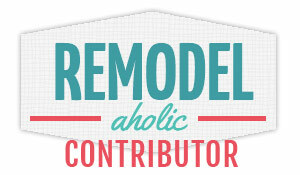 This post contains affiliate links that help me at no cost to you! Read more. To attach the spindles together I cut some scrap wood to size, so it would fit the depth of the bottom of the drawer, and drilled 3/4'' pocket holes with my Kreg Pocket-Hole Jig on each end. Here I am attaching the short sides first. Then I attached the long sides. I got busy and forgot to take more pictures, but you can see I was building a frame or base. I did both short sides first and then attached them together with the long apron pieces. 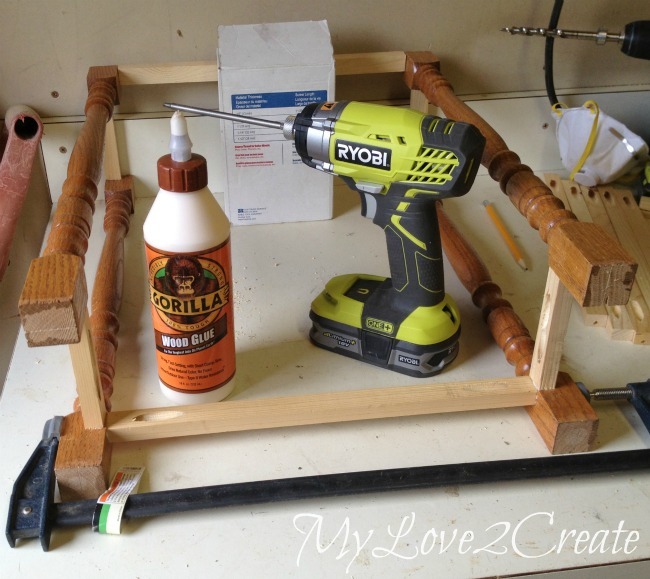 I used wood glue and some Bar Clamps to hold my piece while I drilled into my 1 1/4'' Pocket-Hole Screws . Next, I cut some scrap wood pieces for a shorter planter and I did a quick dry fit before I put it together. 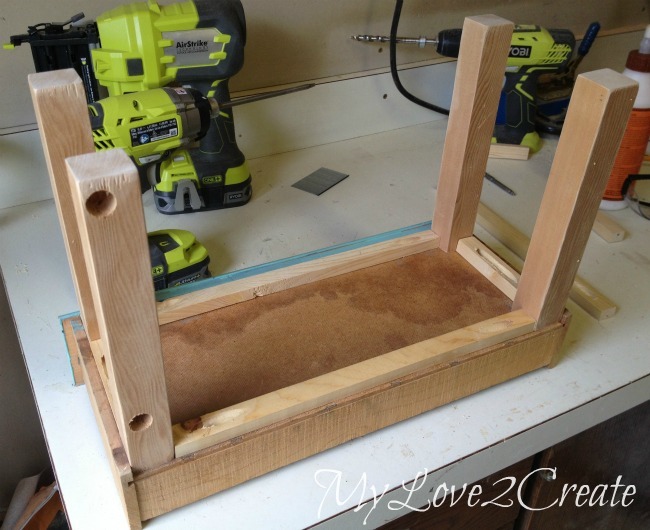 I used the same method to build this as I did with the taller planter. You can see one scrap piece of wood had holes drilled in it, I had to fill them in with spackle, or you could use wood filler too. I had these pieces of wood left over from my Master closet drawer fronts. They were perfect for slats. I taped them together with Painters Tape and cut them all at once. The two ends needed to be shortened so I cut them with my jigsaw, again using my painters tape to save me time! For the short planter I used free 5 gallon paint sticks from the Home Depot, that I had on hand. 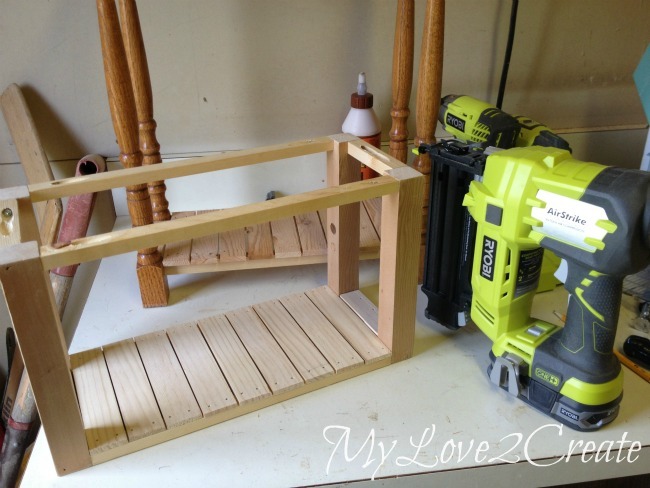 Then I glued and nailed them onto the bases with my New Ryobi Nail Gun !! I got it for Mother's day! Best. Gift. Ever. After looking at them together I was sad I didn't make the shorter one a little taller, oh well. To give it a little more height I gave it some feet using my Gorilla Super Glue . I used wooden knobs for the feet because I already had them on hand, aren't they cute?! To finish I nailed the drawers to the bases, and then drilled some holes for draining. 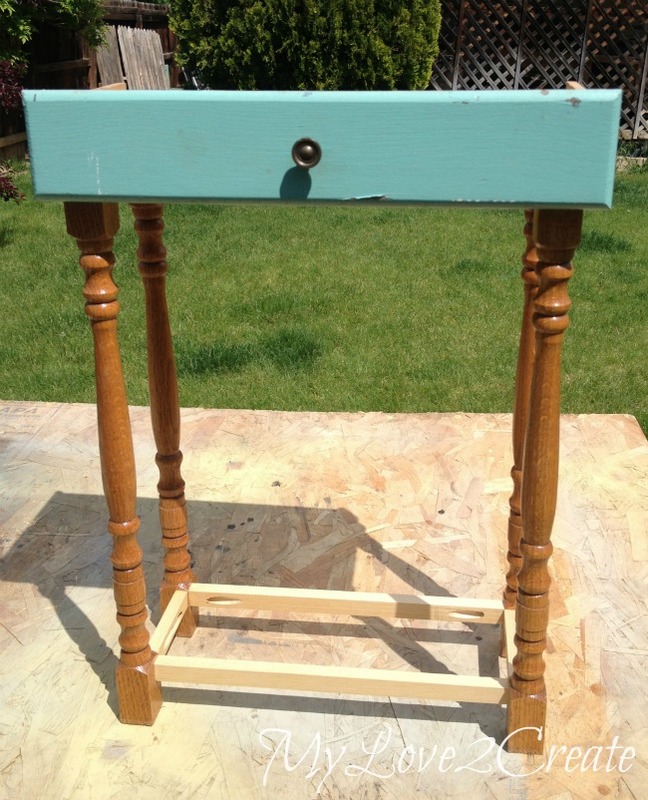 After taping off the drawer fronts I spray painted the bottoms in Rust-Oleum Satin Green Apple . I sprayed them upside down first then right side up. For both planters it took one can, and was SO much faster than painting by hand! Make sure to put some type of Liner in your planters to protect the wood, then plant to your hearts content! I am so in love! I can't tell you how excited I am to have these on my porch! They are sure to brighten anyone's day. I didn't have anything that fit on the small planter so I made this little wooden planter on the bottom in less than 10 minutes (thanks to my new nail gun) and it is perfect! 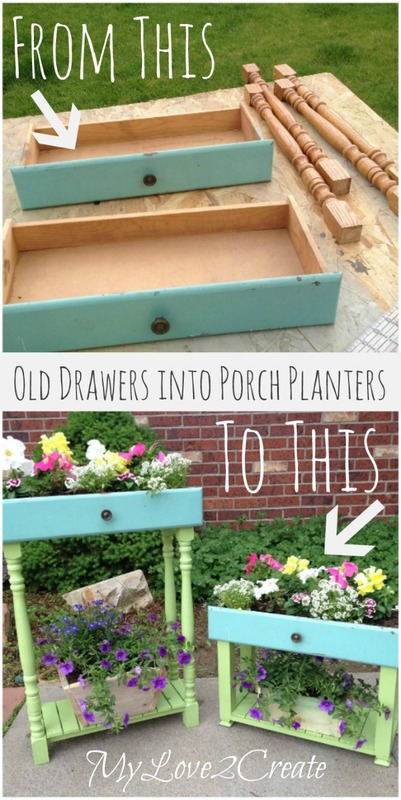 So are you ready to repurpose your old drawers! You won't regret it! 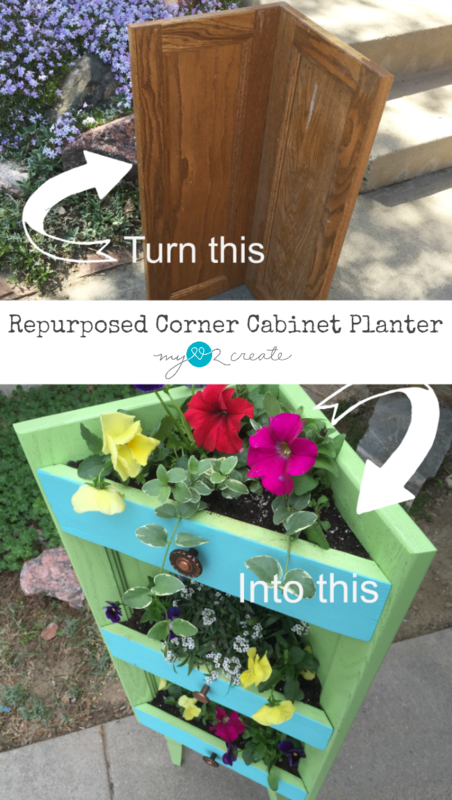 You can also check out my Corner Cabinet Planter I made to match! Or any of my other Planters! I love them too! Thanks for sharing and the tutorial too. So cute and such a cool idea! I love the colors! 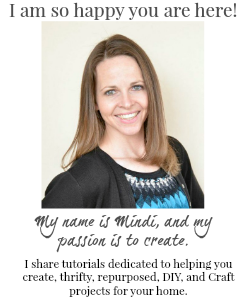 I love love LOVE this project, Mindi! So cute! Your porch planters came out amazing, love the colors also. I'm also looking to repurpose items. You have done a nice job on the tutorial also. Thank you for sharing with the Clever Chicks Blog Hop! I hope you’ll join us again next week! These are adorable Mindi - what a great idea! I bet you get loads of comments about as people arrive at your front door. These are SO CUTE!! I actually have an old dresser I was going to put on the curb for free takers, but think I just might need to keep the drawers for myself LOL. Thanks for sharing! Well, aren't these adorable! :D They look great on your porch. Wow are those pretty! Great job. I love it that something was saved from the trash heap and given a new life. I really like your choice of colors too! 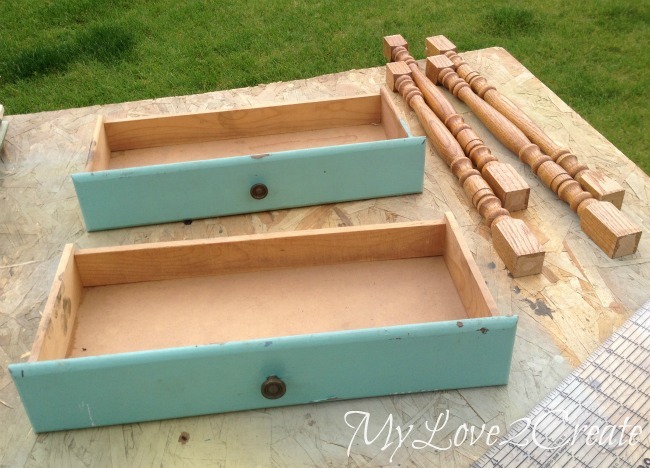 I'm visiting from Craft Frenzy Friday and I love how you have repurposed these drawers. 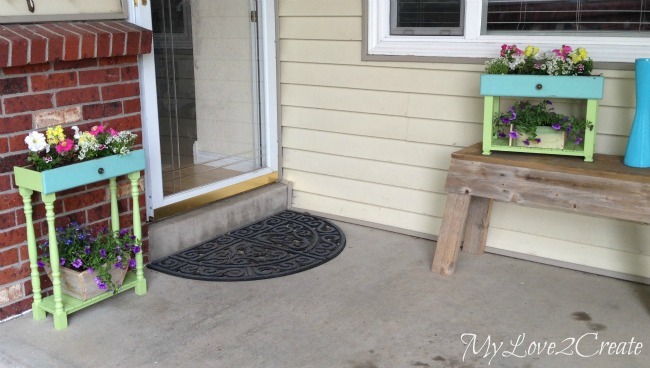 It looks great and you have created something really functional and practical for your porch. I Love this idea!!! 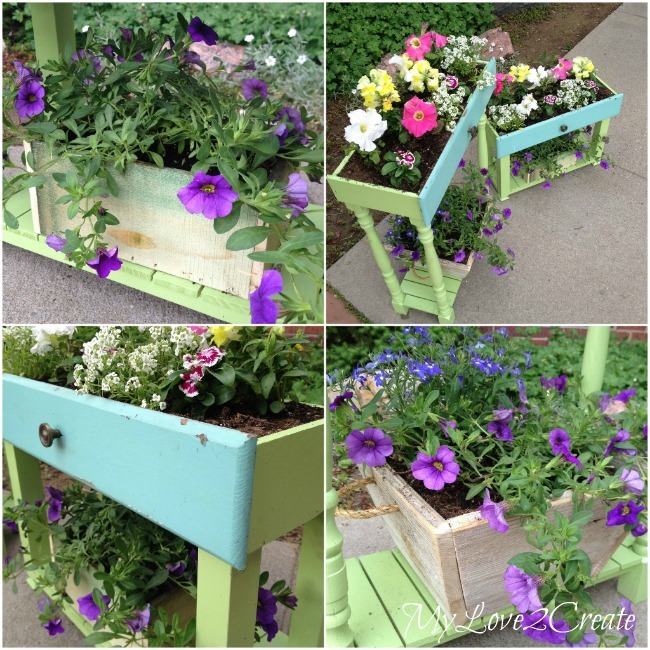 I have been looking for some more planter ideas!!! Did you add anything to the inside of the drawer to protect it from moisture? Thank you so much! Yes, I did add a liner to the drawer before I added the dirt and flowers, so far it has held up fine! Too cute! 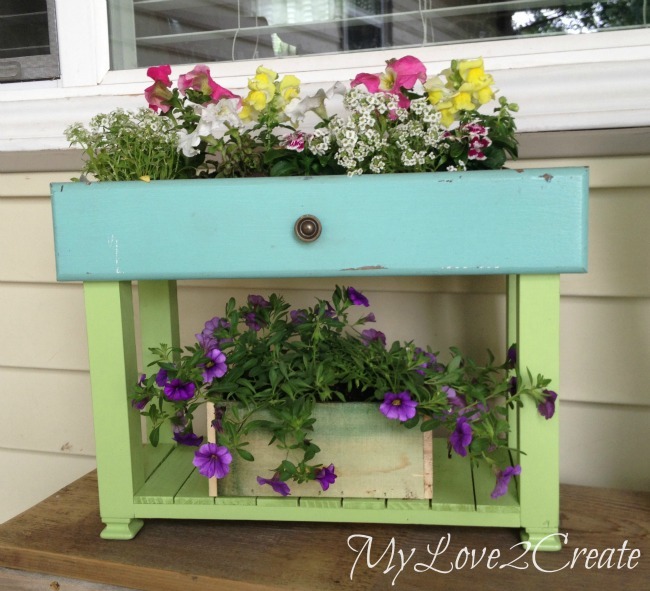 I love the repurpose idea and the colors you've used. This is so fun! Thanks for the fun tutorial. 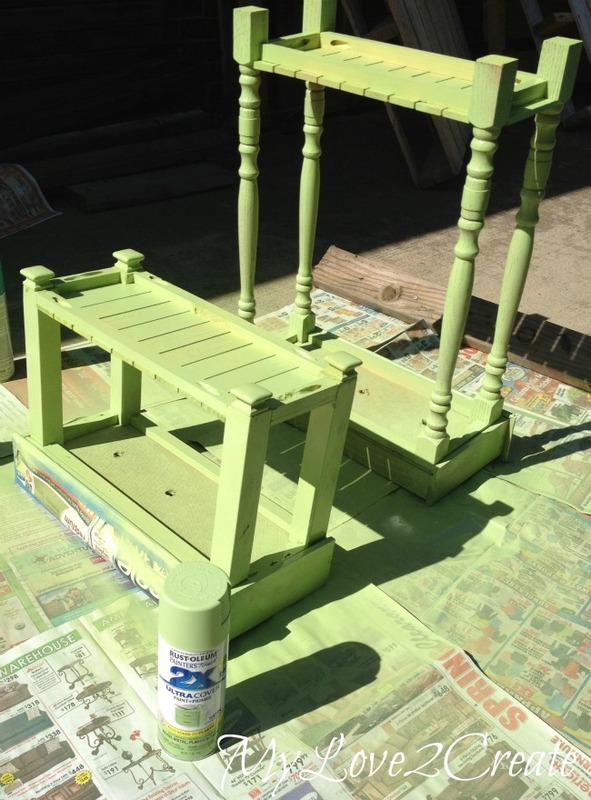 Great idea for upcycling something boring into something useful and pretty! Thanks for sharing at Fridays Unfolded! These are so very pretty... very appealing. :) Thank you for sharing this. 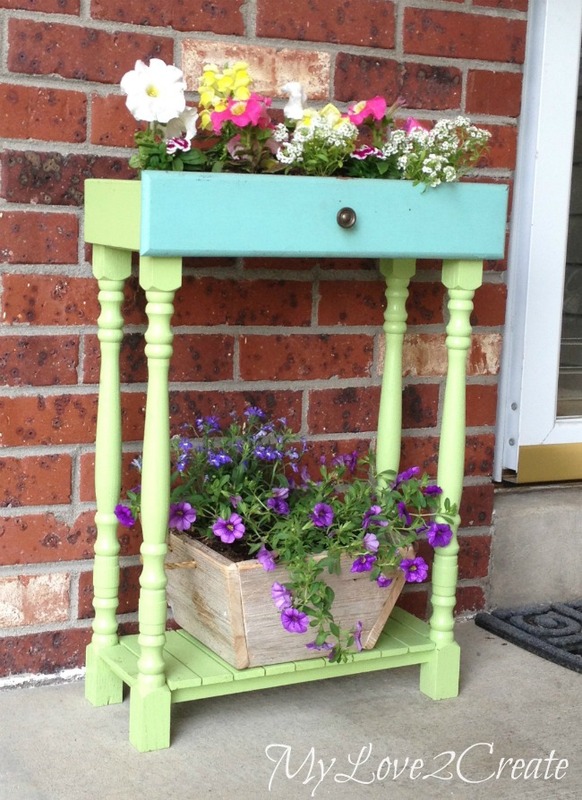 These are absolutely adorable and look awesome on your porch. Need to look for some old drawers. I am in love! These are just the cutest. I kept some dresser drawers and have had no idea what to do with them but now I do!!!! Thanks for the inspiration and I am pinning. Just adorable! So are you! Hi Mindi, just wanted to lyk that your project will be one of the features on tonight's Merry Monday Linky Party. Hope to see you again tonight at 6pm PST. This turned out wonderful, and I like how you used it for plants. The colors are so bright and cheerful. Love these, so cute! Great idea. Love them! Now I know what I can do with those drawers I have been collecting in my garage! The colours are wonderful too! Beautiful addition to the porch. I love the colors you choose, and how welcoming the porch is. Very nice indeed! These look so quirky and fun - I love them! 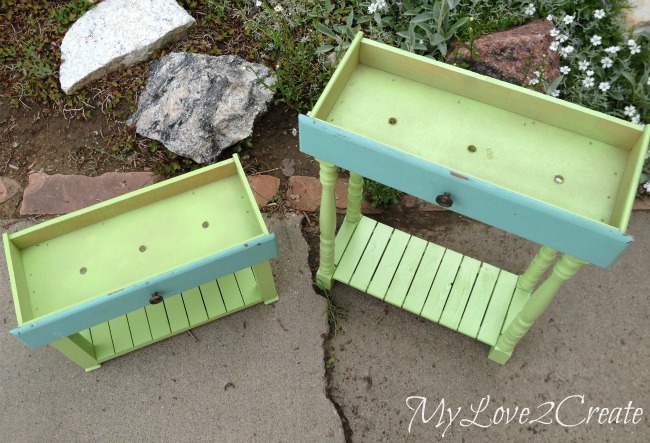 I've always loved these drawer planters and the color you made them is too cute! Pinned!